Menulog delivers for Quan's Kitchen so you'll be able to track your courier on a map. Three pieces spring rolls, sate beef, boneless chicken with lemon sauce, stir fried mixed vegetables and large fried rice. Four pieces spring rolls, sweet and sour pork, chicken with cashew nuts, Mongolian beef, stir fried mixed vegetables and two medium fried rice. Four pieces spring rolls, four pieces steamed shu mai (prawn and pork dumplings), four steamed har gau (prawn dumplings), four vegetable and prawn dumplings, four fried lobster dumplings, four steamed BBQ pork buns, whitebait with salt and pepper, stir fried egg noodle with BBQ pork and Chinese broccoli with oyster sauce. 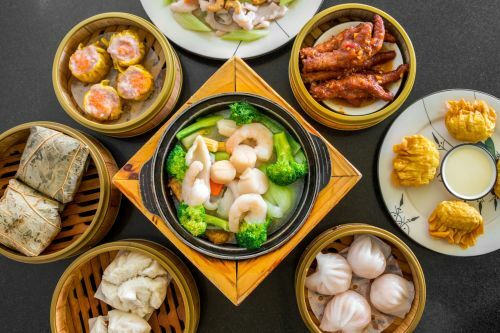 Eight pieces spring rolls, eight pieces steamed dim sim, king prawns with cashew nuts, fragrant chicken hot pot, sate combination, Mongolian beef, roast pork with plum sauce, stir fried mixed vegetables, two large fried rice and two large boiled rice. Four pieces. Prawn and pork dumplings. Spring roll, prawn toast and dim sim. Combination king prawns, BBQ pork, chicken and beef. Combination scallops, king prawns, fish and squid. XO sauce is made from dried scallop, dried shrimp, bacon, garlic and red chilli. Bone with shallot in superior soy. V = Vegetarian and GF = Gluten Free. King prawns, BBQ pork, chicken and beef. With chicken mince and spicy yu xiang sauce. King prawns, BBQ pork,chicken, beef and noodles. King prawns, BBQ pork, chicken, beef and noodles. King prawns, BBQ pork, chicken, beef and wonton. King prawns, BBQ pork and chicken. Fried rice with scallops, prawns, duck meat, snow peas, carrot and gravy on top.